I am one of those types of motorcycle owners who don’t think of their motorcycle just as means of transportation. For me, my motorcycle is like my treasure, my most prized possession, my therapist and the enhancer of my style. Which is why you won’t see me take my baby for servicing in a motorcycle service shop. I know pretty much everything I need to about the model I have and how to maintain it. Don’t think of it as some kind of a biker’s pride, but more like a passion and an interest of mine. I do it because it’s my pleasure to do it. So this post is for all of you who own a motorcycle and don’t see it just as a fast way to get from point A to point B. Maintaining your motorcycle doesn’t have to be a hard task or something to panic about. It should be easy, pleasant and effective if you have the right motorcycle tools. Changing the oil of your motorcycle should be very easy and straightforward process. Nothing too complex, you just need to take the old oil out and put in new one. However, oil isn’t water. It needs to be properly stored and then disposed in the right manner. For that you need to own an oil drain pan where you’d store the old oil and prepare it for transportation to a recycle centre or your local auto shop. A proper cable lube is an essential must for the smooth functioning of your motorcycle. You want the throttle, the clutch cables and the engine entirely to function as smoothly as possible. This can always be done manually, but using a tool is far easier and more effective. A slight mess may result if you use excess lube, so use a rag and wrap it around the bottom for prevention. Among the most important motorcycle tools any owner of a bike should have in his garage is a bike stand. You can’t call yourself a biker if you don’t have this piece of equipment for inspecting and maintaining/parking the bike. Bike stands come in many sizes and designs, but all of them serve the same purpose: to lift and lock your bike assuring it will never fall off. Some bike stands are designed for specific bike models, so make sure you look for the right specifics when you’re getting yours. These are simply indispensable for any motorcycle owner for adjusting certain little pieces on the bike. Wrenches come in a set of different sizes, since you never know for what part of your bike will you come to need them eventually. These would be the essentials according to me. 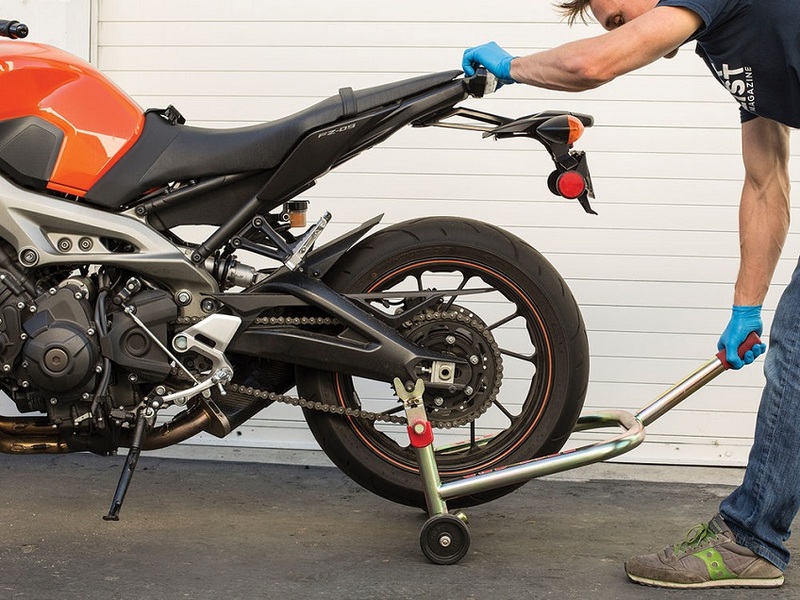 Of course, some motorcycles that are way bigger and have a lot more complex construction would require a lot more maintenance motorcycle tools. And some models would simply ask you to take them to their service centres as their repair system may be one of a kind.